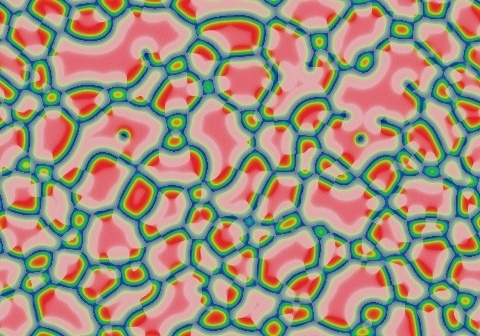 These images and movie demonstrate the behavior of the Gray-Scott reaction-diffusion system with σ=Du/Dv=2 and parameters F=0.0940, k=0.0590. 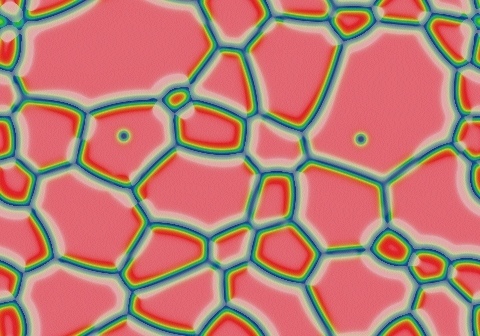 Initial patterns of blue spots on red produce solitons; any worms quickly shrink to solitons. Red spots on blue, as seen here, quickly grow into a matrix of bubbles, that coalesce into larger bubbles as the smallest ones tend to shrink. As seen here, isolated solitons can exist as islands inside the bubbles. If a soliton's bubble shrinks, the soliton is snuffed out (seen at 0:32; note this is unlike what happens to the south). This pattern takes 815,000 tu to evolve into a single large hexagonal bubble; after about another 500,000 tu the edges are almost stationary, straight and with 120o angles.